Male colleague: I heard that Rainbow Dash must save Cloudsdale from a hurricane in the next My Little Pony episode. Female colleague: Patricia’s dating Carl now. But Rachel still believes she’s seeing Harold! Female colleague: Oh. My. Gawd! Male colleague: Just Cause 3 will come out on December 1. Male colleague: Awesome! I can’t wait to blow everything up again! Yuna: I wish I were grown-up. My stupid classmates never want to talk to me about neural networks and deep learning architectures! I feel for you, Yuna. But weren’t you afraid of AIs? Neural networks and deep learning aren’t the same as true AI, though they would probably be critical to creating one. Yuna, go play EvE online. You’ll find somebody there who will… eventually. Who’ll also find people willing to blow up your ship for free. My late wife was a medical microbiologist. David must work in pure research because the folk’s in Katherine’s lab didn’t talk about things like that. You probably don’t want to know the things they did talk about . . .
Has she tried threatening her schoolmates in order to get them to talk about more serious things? Cut to the Ninth Circle of Hell. Those MLP fans in the first panel are gonna have to wait a few months to see the next episode, though. Only if they’re humanoid in appearance. Congratulations to Sandra & Woo, Powree, and Oliver Knörzer for this new milestone! He feels your pain, Yuna. Or not, he didn’t seem disappointed at the direction of the conversations. Indeed. When I grow up I hope I’ll find someone who will want to talk about these things and have thought them out. I’m already an adult… not sure when I’ll grow up nor when I’ll find another grown up to talk about these matters. Wait, ponies are still a thing? Anyway, congrats on 700 strips, you all! Oh, like you wouldn’t even believe. 31, and feeling this SO BAD. And I’m probably going to link to this strip more than I’ve linked to any xkcd. Ooh, I can’t wait till Just Cause 3 comes out. By the time she grows up, she might be the most dangerous mad scientist her world has ever seen. Quite a few readers associate with this comic. Clearly I should have been posting here more often. Of course talking about AI and neural nets and such would, 99% of the time, be off topic. Oh well. At least we have THIS topic. At the moment I am researching knowledge representation and the use of Bayes’ Theorem in artificial reasoning. Anyone who thinks that’s a fun topic is welcome to PM me. …Come to think of it, can you even PM on this site? *click’s a random person’s name* … WOW someone hates a certain president. (NOT talking about politics here.) *tries another name* … WOW someone likes guns. Whelp, that’s enough clicking random links on the Internet. sorry kid. You need technical school for that kind of shop talk, and it doesn’t last outside of the classroom there either. Is that really going to be the plot for the next episode? Man, this season has been really hit and miss. You will never escape it. If she isn’t already, her world has some VERY scary mad scientists. I don’t know what Bayes’ Theorem is, but I’d love to hear (or read) it. You see, I like learning thing just for the h*** of it. You might say information is my addiction. Thankfully, I don’t leave my mind so open my brains fall out. Yuna, creator of the Nerve Gear in this corner of the multiverse. After years of exposure, he’s developed a Tolerance. I totally forgot what Yuna’s and Cloud’s father looked like. Had to go to the cast page to confirm it was him. And thanks to you, now i’m replaying Just Cause 2, hahaha. She’s not mad, She’s just slightly annoyed! After working in the IT industry in various capacities for about 20 years, I started college a few years ago to get my degree in computer science (with a minor in web design, of course.) As much as I love my CS courses, I find that I function much better if I have at least once class every semester where I can discuss something else! Breadth of knowledge is important and being able to put down the software engineering discussion *before* you burn out is even more important. I’ve heard about this, but I’m not really sure what it’s about. Any way you could give me a rundown of it? Oh it’s cool stuff! I mean, if you’re into precisely formalizing human reasoning with mathematics. Which I am, because my own intelligence fascinates me and I really really want to understand how my brain understands stuff. Bayes’ Theorem is a method for calculating the probability of, say, rain provided that the sky is cloudy. Well, “probability of rain, given cloudiness” was the silly test case I was using earlier for study. I did this when I was studying linguistics too, I just invented the most hilariously preposterous examples because I cared about mechanics, not meaning. By the way, I find it easiest to visualize this data as fractions of a chart. I suggest getting a pen and paper and drawing some overlapping circles. Let’s say that on any given day there is a 20% chance of clouds and a 5% chance of both clouds and rain. Then you notice that the sky outside is, in fact, cloudy and you want to forecast the chance of rain today. How you do that is “zoom in” on that “20% chance of clouds,” because it matches your day, and then look at what percentage of that remaining area is simultaneous rain and clouds. Since the latter statistic must exist entirely within the former, it covers 500% times the space. Thus the answer is: 5% * (1 / 20%) = 5% / 20% = 25% chance of rain. Ooh this writeup was quite useful. I caught a few errors crop up in my reasoning that didn’t occur when thinking to myself, and noticed a couple more details. Also, it’s kinda long for a comment but it’s not the most intuitive thing so it’s important to elaborate. I tried to keep it as short as possible though. However that is equivalent to P(A|B) = P(A and B) / P(B). You just explain them with different data or more data so I found the latter equation easier to deal with and thought it might make for an easier explanation. 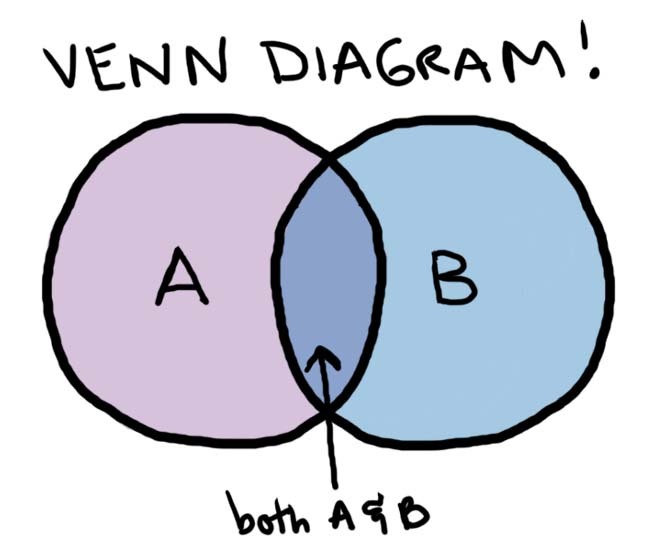 Here’s a venn diagram from the internet. B depicts the area of the last term I used, P(B), and the overlap depicts the first term, P(A and B). What you are looking for is the percentage of B that is also A.
I’m gonna have to look it up first. I did say I wanted to learn about it. I learned that particular equation in class just a few months ago (learning computer security and forenzics). Ah, so you know the IT field. I had wondered who my audience was when I started writing so I decided to assume you are like a friend of mine and hate math, just to cover my bases. Double checking… we would expect the probability of the second heart to be slightly lower than the first so… that checks out. Remember to read P() as “the probability of”. In approximate English that says that the probability that A is true provided that B is true is the of both A and B times the probability B provided that A is true (you could be switching the cause and effect here, depending on what you’re looking at) divided by the probability of just B.
Ok so I need some analogy for that math. I’m not sure whether you already know LessWrong, but it’s usually just the right place to discuss Bayesian reasoning and the like. That link should have been LessWrong, it’s been some time since I last had to use raw html. Hobbyist, though I’d like to get some actual classes and degrees. I’m just a bit stuck on that front because I’ve been poor at my humanities classes and thus can’t get into a college that has any of this. But I’ll learn one way or another and find some way to utilize it. I do know of LessWrong, actually. I’m making my way through their sequences at a rather relaxed pace (read, slow) while I focus on other things. I have’t said anything on LessWrong, I think I feel like I’d be out of my league and shouldn’t bother, or something. Also, I’m not sure how regular discussion works there since they don’t have a normal forum that I’ve seen. Is commenting on their articles the primary means of discussion? This one is a winner, just wanted to say that. The thing to never forget about Bayes’ Theorem is the base rate. A lot of junk science, especially in the health fields, trumpets an x increase in phenomenon y without ever stating what the base rate of the phenomenon is. People can get really wrapped around an axle about a 10% increase in the rate of something that only occurs in .5% of the population. Awww yus XD A MLP reference in the 700th strip! Though damn Yuna is smart. I have only discovered LessWrong a few months ago (through a link in another webcomic’s comment section, actually) and I’m still reading through the sequences as well, so I’m probably not the best person to ask about proper conduct there. They do have a discussion board though, and especially the open threads seem to be a good place to start a conversation. What are they referencing in the second panel?